It’s funny how things work out. 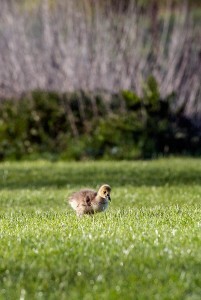 This morning I set out to try and get some shots of chicks at a local pond and ended up with much more. Yes, of course I got to take some nice images but I also got that warm fuzzy feeling when you witness something remarkable. I got to the waterside around 6.30am and as sometimes happens your approach ends up being right where your target is and they see you first and all hell breaks loose. Time to take a breath and let things calm down as mum takes her chicks off to the other side. I take a step back and reassess the position and I spot some more bankside vegetation to my left and carefully approach in a wide arc and low. Just as I got myself into position I see the mallard and chicks clambering up onto a lump of earth under the opposite bank. It was then I realised just how good the location was. Not for me but for them. The brown earth backdrop was perfect for the group to just blend in and be very easily missed. The clump of nettles added further cover. As they settled in I took the pic. My setup is a Nikon D200, 1.7TC, Nikon 70-200 f2.8 VR glass and it was taken at 1/200 f8 ISO400 on a Manfrotto tripod. I sat and soaked in the moment and watched as other wildlife went about their business. 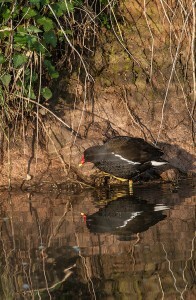 After a few minutes a moorhen swam along the same bank approaching the mallard family. Just as it was foraging I got a couple of shots before it swam off. 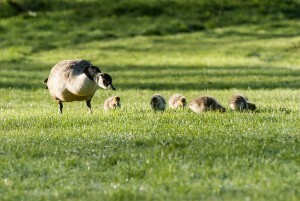 Finally as I walked around the bank I saw a family of Canada geese and their approach couldn’t have been more different! 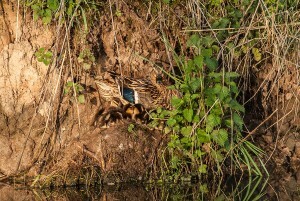 Both parents up on the bank with their chicks close by in full view of anything in the area. I took a few quick pics before heading home. I personally like the lone chick image. Whilst only a couple of feet away from its parents the image shows how vulnerable it is.